How does a key work? A commonly asked question is how does a key actually work? To answer, let’s first cover how the internal mechanism of a lock cylinder works. We will use a euro cylinder pin tumbler lock style as our example. This is a pretty standard type of lock that you are likely to find on the doors of your home. 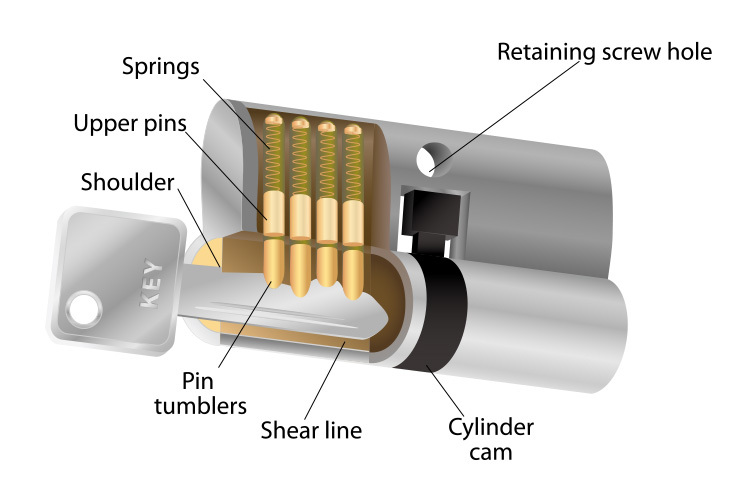 Inside a pin tumbler lock there are – yep you guessed it, pins. Upper pins sit between springs and the pin tumblers. The spring and upper pins are fully extended and the pin tumblers are aligned inside the barrel of the lock. When a key is inserted into the lock they press against the pin tumblers forcing them into the upper chamber pins and compressing the springs. They pins are then pushed to align flush with the shear line. The pins are designed to be different in height and configuration. These will match with the dents of the cuts on a correct key. When a key with a profile that matches the lock is inserted it aligns the pins correctly. This means that the shear line is clear of any pins in the way, which allows the key to turn. The cam which rotates to catch the bolt of the lock is triggered once the key has rotated the barrel. This rotation allows the lock to either unlock or lock. How does one key work with multiple locks? When locks are keyed alike it means the tumbler pins have been coordinated in the same way. If the pattern and size of the pins have been configured to be the same, one key is then able to operate each lock. This is a very basic explanation of how keys work within a pretty standard lock and key system. The world of locks and keys is a complex one. Full of different locks, keys, and combinations to achieve the best security possible in any situation. If you have a particular problem that you are wanting answers for please get in touch.